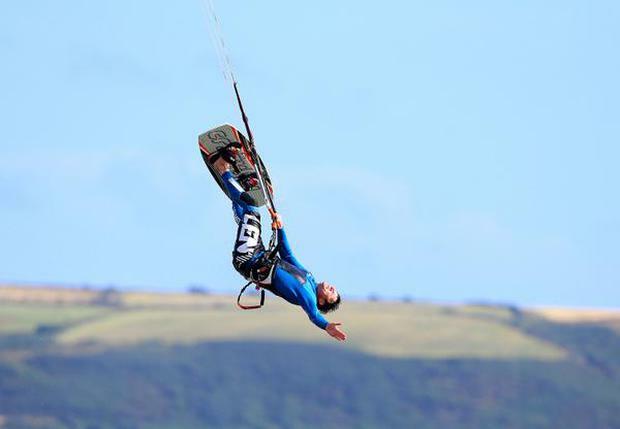 Duncannon Beach is set to host 'Hooked Kite Fest' on August 23rd, following the massive success of the 'Sand Sculpting Festival' on the same beach last weekend. Duncannon Beach in County Wexford is home to the National Kite Surfing Championships, which will take place during Hooked Kite Fest this August 22, and 23. The 2015 Irish Kite Surfing Championship programme was launched today (Friday, August 7) on Duncannon Beach. The Irish Kite-surfing Association and Hooked Kite-surfing host the Championships and spectators can look forward to over 50 kite-surfers from all across Ireland compete in the men’s, women’s and junior (under 18’s) categories demonstrating their skills, airs and speed in a series of Course racing and Hang-time competitions over the weekend. Round one of the competition has already taken place earlier this summer at Ballyholme Beach in County Down and there is still space for competitors to pre-register at iksa.ie. The President and Vice-President of the IKSA will judge the Kite-Surfer skills during the competition. The Hooked Kite Fest also offers a host of free family fun and entertainment for landlubbers, including face painting, beach volleyball, kids power kite lessons, kids dance off, beach games, bungee trampoline, live music plus festival BBQ and beach party is also on offer. For a full programme of see here.